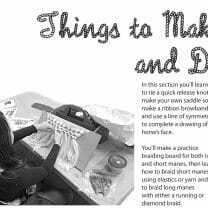 In this section kids will learn how to tie a quick release knot, make their own saddle soap, make a ribbon browband and use a line of symmetry to complete a drawing of a horse’s face. Detailed instructions for how to make a practice braiding board for both long and short manes are provided. Followed by how to braid short manes using elastics or yarn and how to braid long manes with either a running or diamond braid. 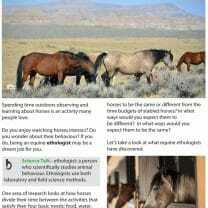 How much does it cost to own a horse ? How much water do horses need to drink each day? 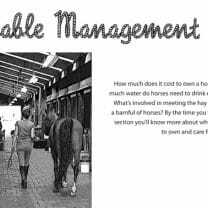 What’s involved in meeting the hay needs for a barnfull of horses? By the time kids finish this section of the Level 2 workbook, they’ll know a lot more about what it takes to own and care for horses. Here’s more fun learning for horse crazy kids. Did you know there’s a mathematical way of determining the day of the week on which an individual is born? In this case, that individual is American Pharoah and by using his birth date and a six step process, kids discover what day of the week he was born on! Algebraic thinking is tested with a series of picture puzzles. Math’s four operations will be used to break codes and reveal information about horses and kids will receive an introduction to gait analysis, a branch of science that studies animal movements. Section 3 of the Horse Lover’s Math Level 2 Workbook is ready for download! Thirty-six pages of math and science for kids who love horses! How many degrees of monocular vision do horses have and how does that compare to our vision? What is a Punnett square and how can you use it to predict a foal’s colour? Did you know there’s a way of using a horse’s Body Condition Score and their height to estimate a horse’s weight? Here’s math and science as it’s used in the real world of horses. For horse crazy kids, the motivation to learn is built in! Here’s a math array worksheet like no other. The world record for largest horse dressage is sixty horses; thirty white, and thirty black. How many different ways can they be grouped together as they move around the arena? What better way to find the answer than by using math arrays? Many horse crazy kids dream of someday having a farm of their own. They may not realize how much math will be required to operate their own stable successfully. This math worksheet will not only inform them of some fence building basics, it will show them how important math is in the real world of horses! Kids follow along as artist Robert Glen designs and creates the Mustangs of Las Colinas sculpture. Proportion and ratio in art. The beauty of horses captured and expressed using an understanding of math. Great STEAM worksheet for budding artists and kids with a passion for horses. Miniature horse pulling competitions are a great way for kids to apply their understanding of measurement and math operations. Word problems from the real-world of horses are sure to engage horse crazy kids. Measures and answers are given in both imperial and metric systems. Let your child’s passion for horses motivate their academic learning. Kids apply their math skills to the real-world of horses as they learn about conformation, how to calculate a horse’s heart rate, make purchases at the tack store, and more. 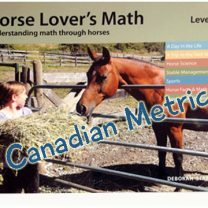 Math is at the grade 4 & 5 level, the horse information is for all ages. Kids look at two top equestrian and horse themed international events. One occurs every four years, the other occurs every twelve years. They write the pattern rules for both these events, extend the patterns, then determine in which years the patterns overlap! Math at the grade 4, 5 level. Horse information for all ages. North America’s biggest thoroughbred auction takes place each year in Kentucky. High quality thoroughbred horses cost a lot of money. Is there a better way for horse crazy kids to apply their understanding of place value than at the Keeneland September Yearling Sale? Four pages of whole numbers and place value in the real world at the grade 4 and 5 level. Answers included. A trip to the tack store is a great opportunity for kids to apply their understanding of money, price comparison and making change. Calculating unit price determines which saddle soap is the best buy. 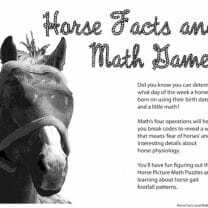 An elementary math worksheet for horse crazy kids!